Best Unicycles Explained – TOP 10 reviews, tech specs, ratings and much more! In short, you are about to discover the Best Unicycles of 2018. Unicycles can be used as recreational vehicles or as a commuter’s help. In urban areas unicycles are used as a last mile vehicle to get you from the bus stop to your office. They proved to be fast, cheap to ride and very eco-friendly! Also, unicycles are easy to carry around, do not need any parking space and can help to keep you in shape on daily basis. There are a lot of Pro Unicycle riders in US that cover long distances, tour the cities and go on nature rides using unicycles. It takes about an hour to learn how to ride one and it can become your “go to” workout in 2018. There’s a first time for everything. If you’re a beginner, stepping onto a one-wheeled contraption can be electrifying and terrifying at the same time. Most models neither have handlebars to grip nor saddles to sit on. All you have are two foldable pedals and a wheel in between. 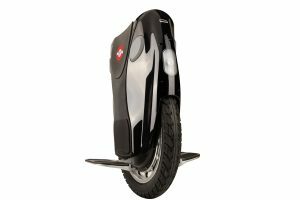 However, for those who have crossed the beginner mark, the unicycle has proven to be a better alternative to e-bikes and scooters. It is, believe it or not, comfortable to use and easier to maneuver. Customer reviews rave about how riding unicycles is easy on your back because you aren’t hunched over. Check out our unicycles and see how this one-wheeled wonder is slowly taking the streets (and the world) by storm! 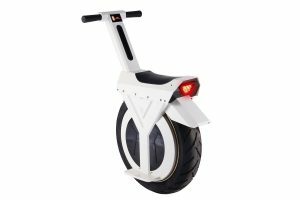 Congested roads, the need for environmentally sound transport and cutting edge technology are making the electric unicycle very popular as a last mile transportation device. Most unicycles are waterproof, beautifully designed and lightweight. When it comes to the best unicycles, it all boils down to speed, mileage and comfort. Here’s our take on the TOP 10 best unicycles. Download the app on the Apple App Store or the Google Play Store and pair it with your One S1. Go through the tutorial and learn how to ride and brake with confidence. You can control this model’s safety features, monitor speed, light colors and more via the App. The best part? You get 15 miles on a single charge. The InMotion folds up like a travel bag on wheels. It features a futuristic design and comes with a bi-channel wireless Bluetooth speaker by Texas instruments. This model has a waterproof surface and comes with an anti-slip footboard. With a maximum load of 330 lbs, the ArtWheel 18” is one of the more powerful unicycles in this list. Climb at angles of 30 degrees and get more mileage with just one charge. The batteries on this model come with protection from overcharging, overdischarging and overcurrent. Airwheel’s Q series feature the well-loved twin wheels for its stability. Perfect for the novice rider, it alerts you when speeds goes beyond 7 mph. The fresh colors and streamlined design of the Airwheel Q5 give it a refreshing, softer look. 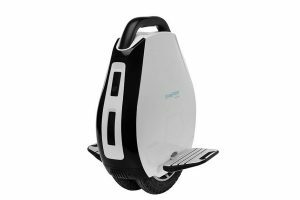 Customers love the Airwheel X8 for its smooth and quiet motor. This model comes with an attractive plastic casing and a 16-inch magnified wheel hub that guarantees safety. 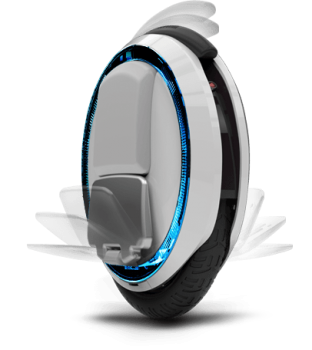 Airwheel’s Q3, as with other 1 series models, features twin wheels. This makes it more stable and easier to balance. The Q3 is the most classic looking model. Choose among 4 different battery versions. Ride through different types of terrain. The KingSong 16S is your unicycle with all the bells and whistles. It looks great, comes with solid headlights and breaklights and is powered by a huge 800W motor and 680 W battery. Size-wise, this model fits under a normal restaurant chair. You could expect to take this all-terrain model on off-road trips. 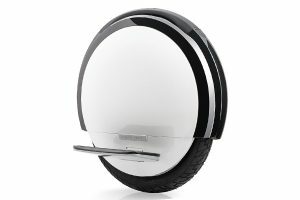 The Electric Unicycle Self-Balancing Seated Motorcycle 17” is a looker. With a 500W motor and a sturdy build, you could expect to take this all-terrain model for off-road trips. 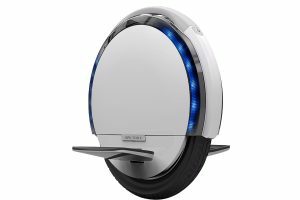 It has a built-in self-balancing gyroscope that allows quick 360 degree rotations as well as smooth rides across town. It’s a Ninebot and its Batman! Enough said. With a powerful 500W motor and the ability to ride up a 15-degree incline, this model is the coolest ride there is. It’s comfortable, easy to maneuver and is a great unicycle overall. The Swagtron SwagRoller tops our list for its distinct design, dual centrally position 14” air-filled tires and 450W motor. All these features combined make for comfort and stability. The learning curve for this model is short. What we love best is its suitability for various types of terrain. Cruise through gravel, sand or grass. Ride even better on hard and smooth surfaces. Climb over inclines of 15 degrees. Unicycle manufacturers are making their models stronger and smarter with every update. There’s a unicycle for both weekend warriors and urban troopers. And if you plan to log in more miles on a one-wheeled wonder, you want your unicycle to have a great distance range and a motor that won’t run out just when you’re having fun. Here are the models that made it to our TOP 3 Unicycles for long outdoor rides. 5 miles is ok. 10 miles is better. But 40 miles is AWESOME. Take this gorgeous unicycle on your next trip and go sightseeing for hours on end. Best part… it has a maximum load capacity of 330 lbs. When you think of unicycles, the KingSong 16S is the model child. It has all the bells and whistles. With a huge 800W motor, you can breeze past 38 miles on this one. Best part… it is small enough to fit under a chair. This all-terrain model is great for off-road trips. 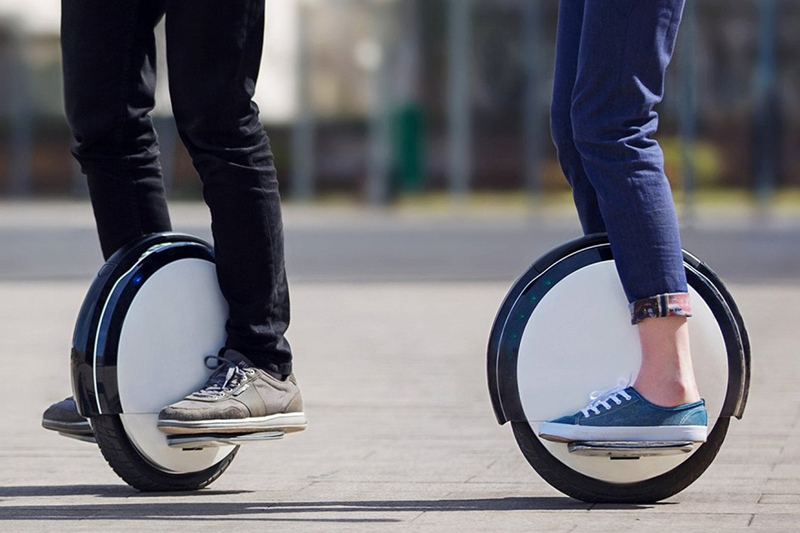 We wouldn’t recommend stunts on any unicycle but you can bust your moves with this one thanks to its self-balancing gyroscope. Best part… quick 360 degree rotations (as well as noticeably smooth rides across town). For pros, we recommend models that can churn out great mileage on a single charge. You want power for those sharp turns and inclines. And you want a distinct design that screams you’re no amateur! These pro models shows who’s the maven! Here’s our TOP 3 Unicycles for Pros. With its own app on the Apple App Store / Google Play Store, pros can pair their smart phones with the Segway One S1. You can control this model’s safety features, monitor speed, light colors and more via the App. The best part? You get 15 miles on a single charge. The InMotion SCV V3 PRO is the quintessential unicycle for the experienced unicycle user. It features a futuristic design and a waterproof surface. Fold in a sec and roll like a travel bag on wheels. The anti-slip footboard makes it a joy to ride. A unicycle is a one-wheeled bicycle. Its obvious, we know… but with this said, if a bicycle requires serious balancing skills, a unicycle will require twice the effort. It will test your ability to maintain balance not just from side to side but forwards and backwards too. For novices, we recommend a unicycle that has large wheels. Bigger wheels (at least 16 inches) mean smoother rides. It also means bumps and small potholes won’t affect your balance significantly. Here are the TOP 3 Unicycles for Novice Riders. Novices will take to this unicycle like duck to water thanks to its comfy seat and large wheels. The tire on this model is a whopping 17”. An alarm sounds off when the rider reaches a speed of 15 mph. Other notable features that beginners will appreciate is an intelligent sense system and a built-in self-balancing gyroscope. The ArtWheel 18” looks like a pro’s unicycle, but it is so easy to use, first timers will get a hang of it in no time. With an 18” wheel, and alarms at 12 mph, learning to ride this model and gaining the confidence to bust moves won’t take long. This unicycle just arrived from the future. It has a distinct futuristic look to match its slender 18-inch wheels. It folds to a very compact size. Customer reviews have rated this unicycle 5 stars when it comes to comfort and maneuverability. A few years back, unicycles were mocked as the acrobat’s mode of transport. It’s the stuff circus stunts and aerobatics were made of. But with over populated cities, congested roads, rising gas prices and pollution, more and more people are now giving this one-wheeled wonder a second look. Anything compact, lightweight, speedy and with low rider effort to get you across that “last mile” is a great tool. The “last mile” is that distance from your office to the bus stop, train or even residence. Say, you drive 20 minutes to the train station, ride the train for an hour and take a brisk 30-minute walk to the office. Those last 30 minutes can be made even shorter and more comfortable with a last mile ride. It saves you time and a lot of effort. While not a popular choice at the moment, the unicycle has been climbing its way to the top when it comes to last mile rides. This is because once balance is mastered, it’s the most compact and cost effective gadget among its two-wheeled or three-wheeled cousins. Its sturdy, waterproof (at least majority of models are), very compact and requires little maintenance. You could always go old school and pedal with a bike or even give that e-scooter a try. Your only concern will always be parking and storage. But with unicycles, compact takes a whole new meaning. You don’t need trunk space. Just flip, step on it and go. When you’re done, simply fold and store under a chair. So give unicycles a try. Customers rave about how strangely practical this one-wheeled mode of transportation is (once you get past the learning curve). They’re very light and portable. Wear a backpack and you’re set. Unicycle with larger wheels have proven their mettle when it comes to dirt, grass and bumpy roads. They’re ideal both for short trips and longer, leisurely explorations.